I don't usually work with green, but Karen has inspired me to try and use it a little more. I do believe it's her favouritist colour in the whole wide world! 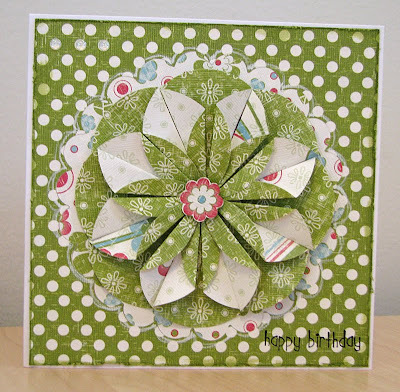 Liz has challenged us to make this gorgeous Dahlia (instructions here) and use it on a card. It's a gorgeous flower, and so easy to make! I've been loving these gorgeous Daisy Bucket papers. This is a card for Liz's monochromatic challenge from WCMD last weekend. A little late, but I really wanted to give this a go, as I've never tried monochromatic before. Loved the result, but I tell you, it was a HUGE challenge not to add any other colours! Using the Daisy Bucket papers again, as well as labels 8, and a few new Christmas stamps I acquired the other day - Stampendous and Stamp It, I think? Gorgeous cards Leah - so glad you got to try out the dahlia flower! 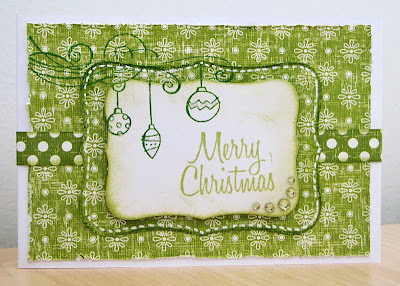 Your card turned out fantastically! This paper folding technique looks really effective! I LOOVE the colours too! I remembered your entered my last blog candy so I thought I would swing by and let you know I have more goodies up for grabs at the moment!